MALAYBALAY CITY (April 19) Bukidnon State University President Dr. Oscar B. Cabañelez urged university officials to “aim higher” during the University-wide Target Setting for 2018 on April 10-11, 2018. University officials participated in two-day workshops to cascade university targets held at the Conference Room of the Research and Extension Building. Dr. Cabañelez first cited the on-going alignment of the university, from ISO 9001: 2008 to ISO 9001: 2015 version. “Go on with the work for alignment. If we are properly guided with standards, it will be easier to influence how we do things,” he said during the opening of the workshop. At the end of the workshop, participants, mostly deans, unit and office heads have produced their targets and Office Performance Commitment Review matrices to be used in annual performance evaluation. The Anglo Japanese American (AJA) Registrars have assessed and registered against the requirements of ISO 9001:2008 standards the Quality Management Systems of Bukidnon State University in August 30, 2017. BukSU obtained its Certificate No. AJA-17-0082 after a series of audits since 2016. The university intends to submit its quality management systems again for a higher level of certification – the ISO 9001: 2015, this year. The ISO 9001 works to ensure organizations like higher education institutions (HEIs) to continuously provide products and services that meet customer and regulatory requirements. In 2006, President Gloria Macapagal Arroyo issued Executive Order 605 institutionalizing the structure, mechanisms and standards to implement the government quality management program. State universities and colleges were enjoined to establish ISO-Quality Management Systems and be certified, Ms. Rosanna Sambile-Generato, university planning officer told buksu.edu.ph. Dr. Cabañelez also cited the need to continue its preparation for Institutional Sustainability Assessment (ISA), which is a Commission on Higher Education (CHED) quality assurance process that assesses the institutional sustainability of an HEI in the key area of quality of teaching and learning as supported by governance and management; support for students; relations with the community; and quality of exposure, research and creative work. He said ISO and ISA certification are both requirements by CHED and the Department of Budget and Management for leveling of state universities and colleges. “Aim for higher levels of (AACCUP) accreditation and SUC leveling, which could affect the budget of our university,” he added. From the academic group, Dr. Cabañelez asked if there can be more programs be identified as “Center for Development” (COD) and “Center for Excellence” (COE) by CHED. So far, BukSU has two programs declared as COD, namely the College of Education Teacher Education program and the College of Arts and Sciences’ English Language Program. The president mentioned the Mathematics and the Public Administration programs, as examples that can level up. “We are capable (of having more centers) like the other universities,” he added. The president also urged the different colleges to improve the faculty profile, encouraging the faculty to pursue and finish their post graduate studies and finish their researches. He said there is a need to firm up faculty professional development, along with the development also of the university’s non-teaching personnel. The president encouraged regular health and wellness activities for teaching and non-teaching staff. 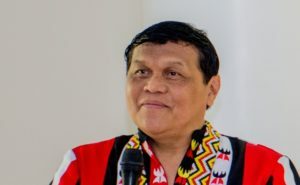 On the opening of BukSU’s new campus in Casisang, Malaybalay City, the president did not give a time frame but hinted the gradual transfer of the College of Education’s elementary and secondary laboratory schools so that it could not affect faculty mobility. From the administration, the president also urged for sustainable use of resources. “There should be more energy conservation initiatives – to cut the P1 million a month energy cost,” he added. He cited the turning off of lights in classrooms and offices when no longer used as example. He also noted the use of solar panel, to help facilitate energy savings. He also asked for the establishment of more water catchment to help in the maintenance of cleanliness in comfort rooms. For the new campus, the president instructed officials to check possibility of a deep well for alternative water sourcing. The president also called for the strengthening of cooperation with the local government units, especially in the operation of its satellite campuses and extension campuses. BukSU runs six extension studies centers in the province and set the opening of five more in June 2018. The existing centers are in the municipalities of Baungon, Kadingilan, Kalilangan, Libona, Malitbog and Talakag. The new centers, with the support of Senator Juan Miguel Zubiri, will be opened in Cabanglasan, San Fernando, Quezon, Kitaotao, and Damulog towns. The university has remaining 12 external studies centers, centers outside the province of Bukidnon, including the one in Iligan City for graduate students. The president also instructed the Office of the Student Services to closely coordinate with the alumni association. He said the alumni can also help in the development of the university.